I have not been doing many recipes nowadays as my home renovation work is on in full swing. And my kitchen is not fully functional. But nonetheless yesterday Sujata and me cooked up an easy boiled egg curry and Malabari Parathas. 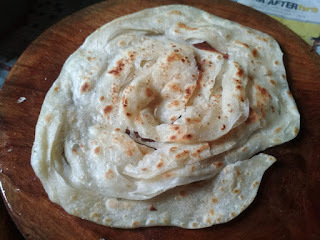 Malabari Parathas is a delicious layered Indian recipe mainly prepared in South India. Its made from maida flour, served with gravy and dry dishes as a main accompaniment. 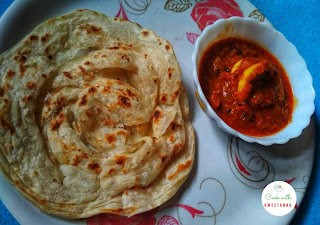 So lets first learn to cook up the Malbari Parathas. 1. You need to seive both the whole wheat flour and maida with baking soda. I do this step twice so that it really mixes well. 2. In a flat bottom dish, make a hole in the centre and add sugar, salt, milk and oil. 3. Now add one cup hot water, mix this gently with a spoon. 4. Once cooler, knead the dough with your hands till smooth and soft and doesn't stick to hands. 5. This dough needs to be covered with a moist muslin cloth. Keep it aside for minimum 45 minutes to 1 hour. 6. To start making the parathas you should divide the dough in equal sized balls. 7. Now dust the working surface with flour. Roll each ball as thinly as possible into a long round line. 8. Smear or add oil on this rolled dough. 9. Now hold the long dough and twirl it round and round like a jalebi. Flatten gently with palm. Complete all the dough balls in this manner. 10. 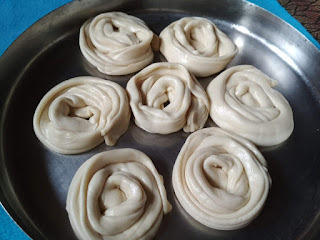 Roll these spiral balls of dough with a rolling pin to make round circular shapes and press the last edge onto the center of the rolled paratha. 11. Heat tava or griddle and now place the paratha on the tava and fry on both sides. 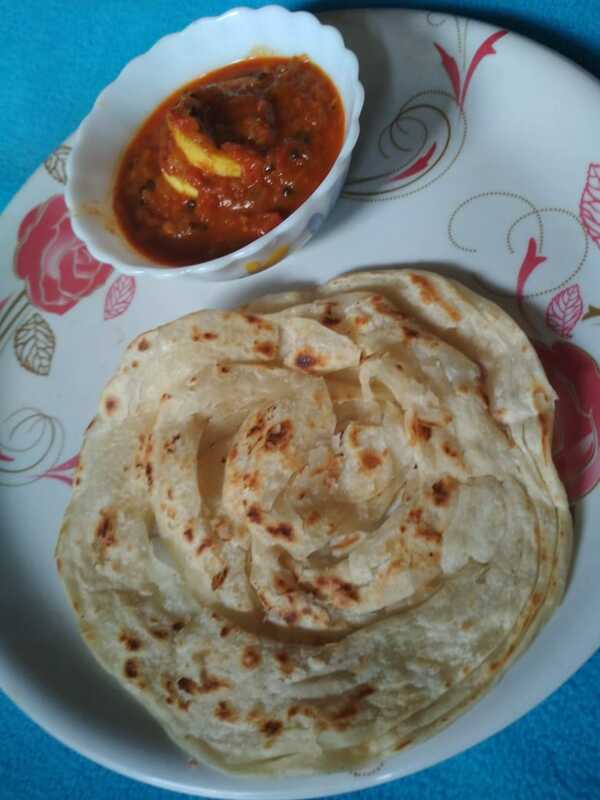 Drizzle oil on the top and let the paratha cook with a sizzle. 12. Let the parathas cook till they are crisp and golden in colour. 13. Now its time to serve it with stew, Indian vegetable or lentil curry or dal. I served it with an easy spicy egg curry. Check out the next blogpost for the recipe. This is a recipe given to me by my sister Farzeen. She just enjoys cooking for her family especially non vegetarian dishes. But just like me doesn't tire herself in the kitchen. 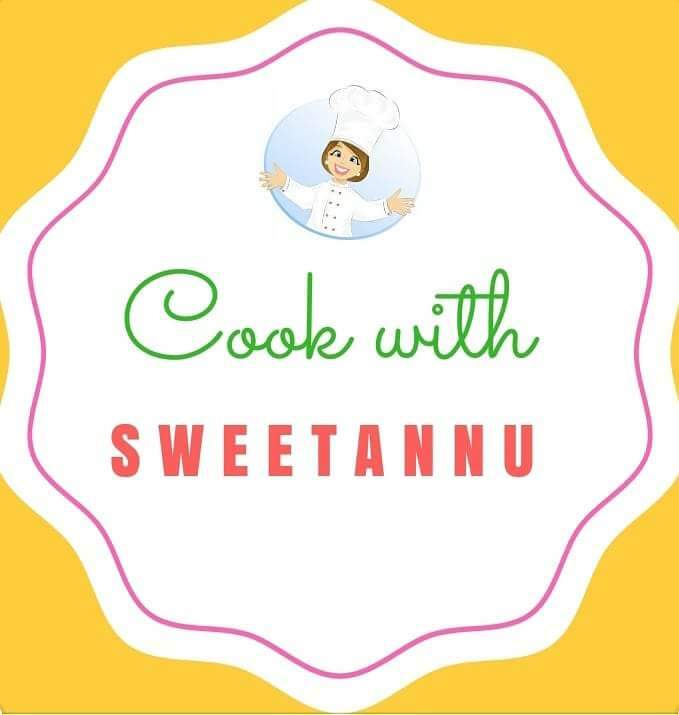 She experiments with dishes to enhance flavours yet reduce cooking procedures. The end result is always finger licking good. 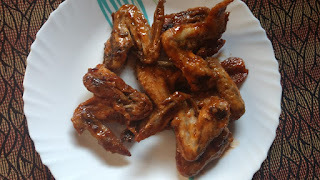 So today, I share with you all, her grilled chicken wings recipe. She makes it in two/three ways. Its an excellent starter and finger food but best of all, protien rich. 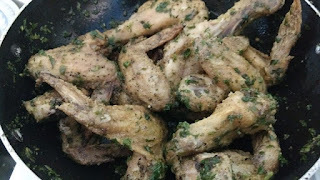 For half kg Chicken wings/ you can add drumsticks if you wish. 1. Wash, dry, and season the wings with the salt, pepper, olive oil and honey. 2. Now add the baking powder and cornflour and marinate well. 4. Bake for 20-25 minutes. Turn the chicken wings so both sides turn golden brown. 5. Now in a wok, add butter. You can add olive oil instead. 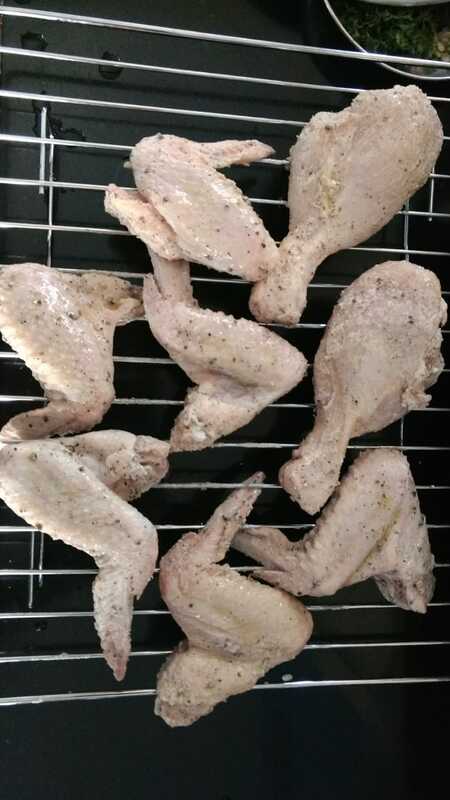 Place the chicken wings. 6. Stir in the basil, parsley and barbecue sauce. 7. Toss for another five minutes and serve it hot with salad/ fries on the side. For variation you can add garlic and spring onions to the wok while tossing the grilled chicken wings. 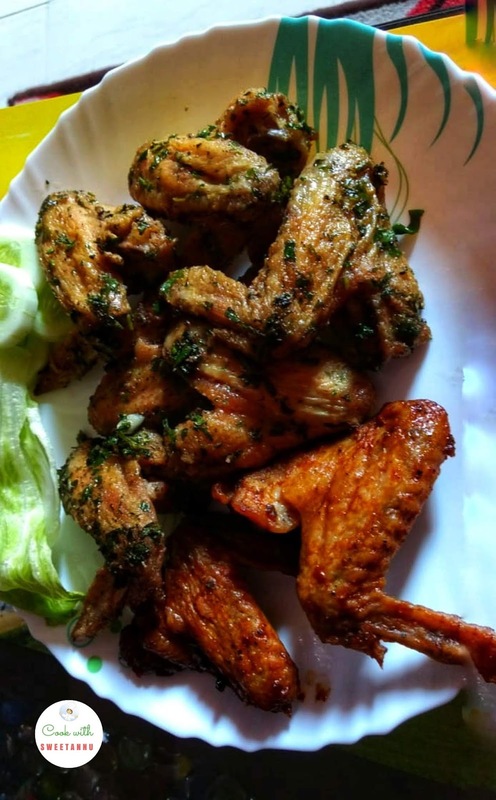 Typically, wings are fried or baked and tossed in sauce just before serving. They turn out tender, juicy with a caramelized, crispy skin that everyone will love. 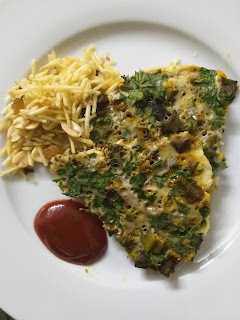 Many of my friends have given up non veg food and have turned vegetarian without any regret. Then I wonder are they getting enough protiens from vegetarian sources? 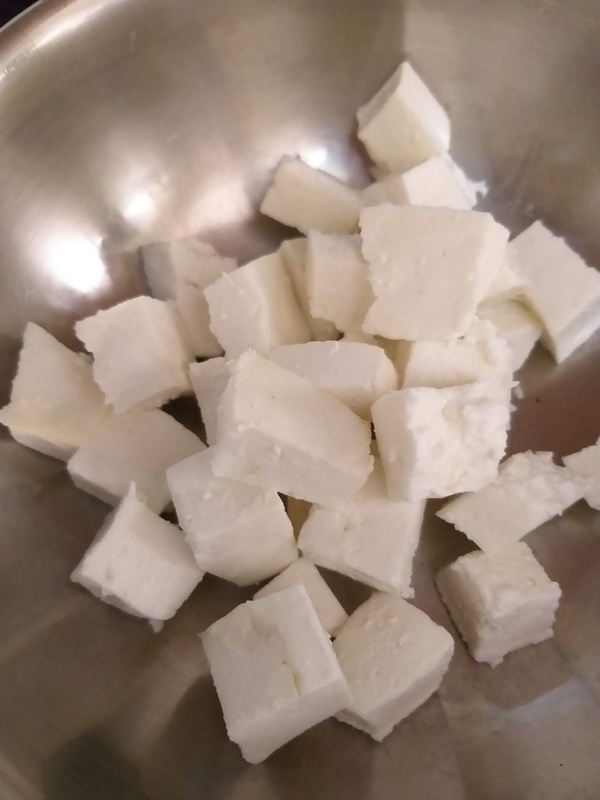 Cottage cheese/ Paneer is a type of cheese that is high in nutritive value. It is rich in calcium. 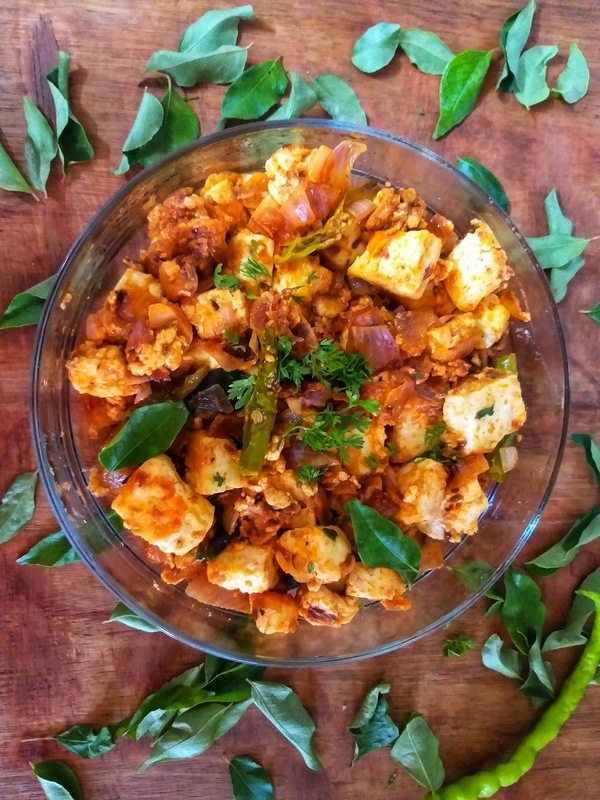 Today I tried to cook up a southern style Paneer 65 with a zesty chilli / curry leaves flavour. 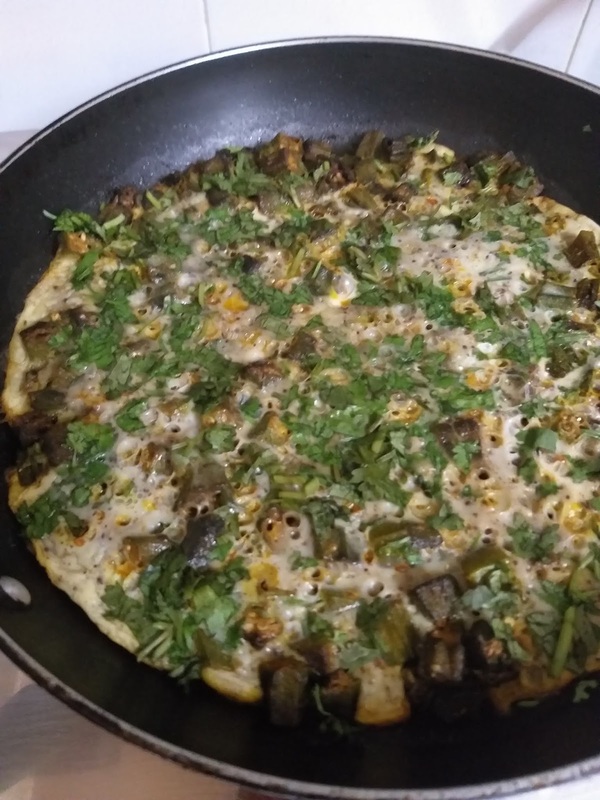 Hope my vegetarian friends will find this recipe interesting. 1. First cut the paneer into small pieces. 2. Take a mixing bowl, to make the marinade. 3. Add rice flour, curd, cream, ginger garlic, red chili powder, garam masala, and pinch of salt. Mix well and set aside. 4. Mix it gradually add little water if required to make a thick yet flowing batter. The batter should not have lumps. 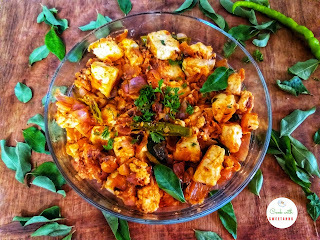 5.Mix in the paneer cubes so that all the pieces are coated well with the masala and let it sit in the marinade for minimum half an hour. 5. Now heat 2 tbsp oil in a pan The oil should be medium hot. 6. Add curry leaves and slit green chillies and let it splutter. Now add onions and sauté till pinkish. 7. To this add the paneer pieces. 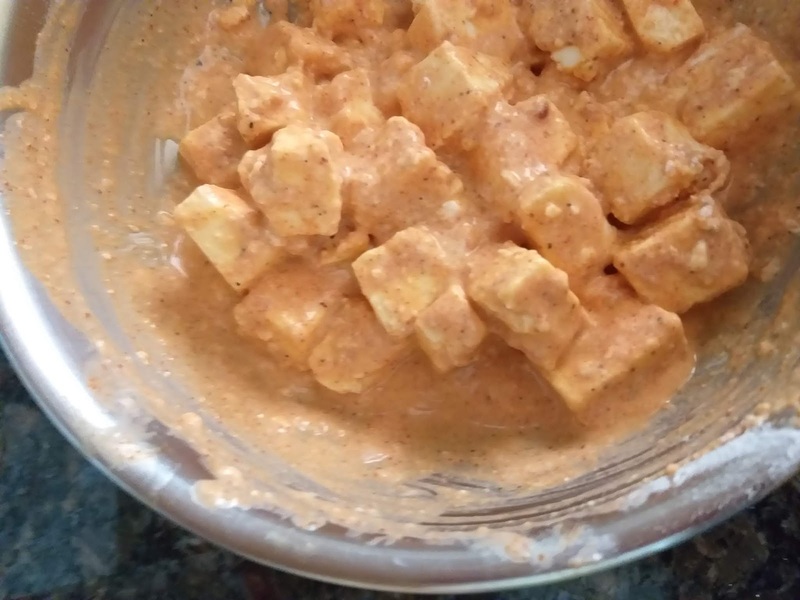 Gently mix and see that paneer doesn't stick to bottom. 8. Now add the lime juice. 9. Cook further till all water evaporates. 10. 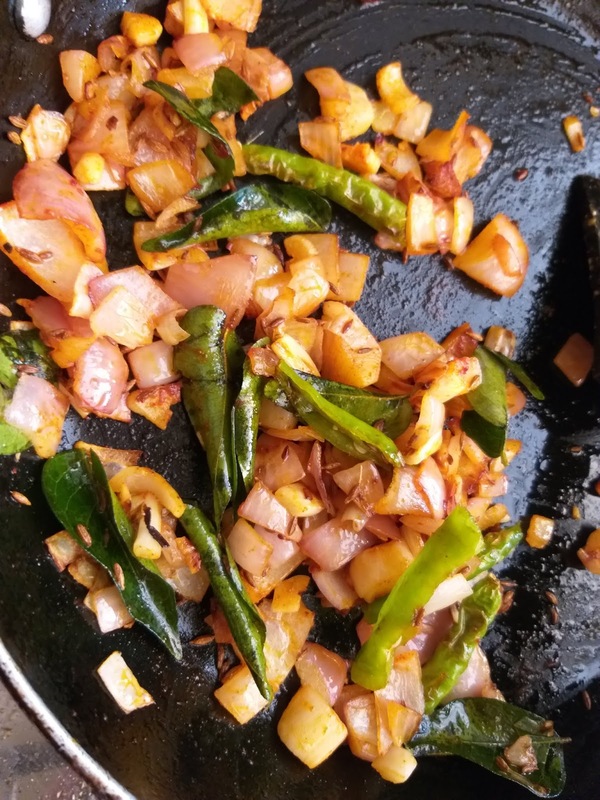 Garnish with corriander leaves and serve hot like a starter or with roti as a main dish. You can also deep fry the cubes instead of sauté. The paneer can even be toasted in the oven for zero oil usage. You can avoid onions if you wish. My experience of making bhinda per eedu dates back to my early marriage days when I just knew just a few dishes to cook. And this dish was a life saver. 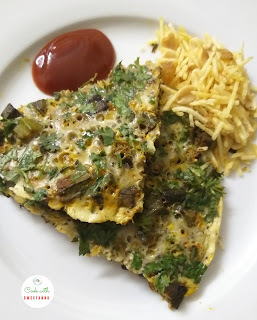 Okra or lady's finger (Bhindi) have to be first well cooked and before serving the dish, the okra is topped with a well beaten layer of eggs and a lavish bhabraving (sprinkle) of pepper and corriander leaves. Bhinda per eedu is the best way to get your family to relish vegetables and enjoy the protien of eggs. We bawas love eggs at any meal. Note the ingredients and get those eggs cracking. 1. In a frying pan, add the oil, chopped onion and saute till brown. 2. Add ginger garlic and saute further till the raw aroma is gone. 3. Add the chopped okra and stir up for two minutes. 4. Now add dry masalas and cook well. Add the chopped tomatoes and continue cooking. 5. Add salt and lime juice at this stage. Cook the orkra till soft and is cooked. 6. Now beat the eggs with salt and pepper. 7. Use the back of your spoon to even out the cooked okra in the oiled pan, so that you have a flat base for the egg layering.Reduce the flame to low. 8. Spread a layer of the seasoned eggs over the okra mixture in the pan. 9. Cover the pan with a lid and let the eggs cook on a low flame for about 10 minutes, till they are done. 10. Garnish with corriander leaves. 11. 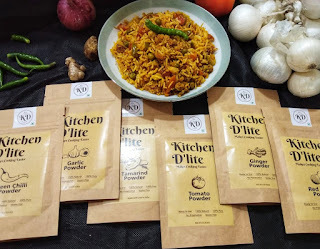 Serve it hot with roti ketchup and saali on the side. 1. Sometimes you can crack whole sunny-side-up egg over the bhindi to create a more wholesome meal. 2. Cook the eggs on a low flame so that the okra doesn’t burn at the bottom of the pan. But trust me, sometimes a crispy layer of orka at the bottom tastes very yummy. 3. You can even bake the egg layering procedure in an oven.